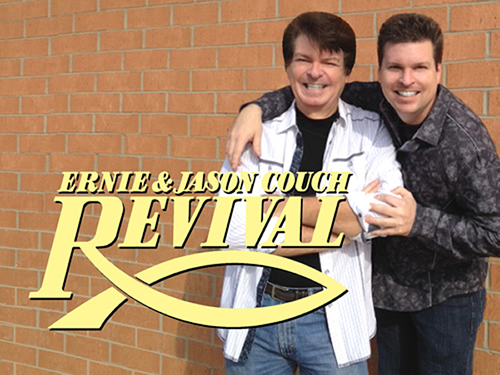 Nashville-based, Ernie Couch & Revival, is undoubtedly one of the most exciting groups in gospel music today. EC&R is high energy in motion featuring a sound reflective of the diverse musical heritage that has made Music City internationally famous. The group's unique blend of traditional, country, and contemporary gospel music speaks to people of all ages and all walks of life. EC&R's rich history is one of a great continuing musical journey that had its beginnings in the early 1990s. Both Ernie Couch and, favorite son, Jason Couch had worked with the Plainsmen Quartet in the late 1980s. When Ernie and Jason left the Plainsmen in the summer of 1990, they decided create their own group, and over the following year, formulated what they wanted to incorporate within the purposed group. They decided to present "live" music. Due to the reality of economic boundaries, the ongoing challenges of finding and keeping personnel, and the lack of individual instrumental musical skills, many groups had gone to canned music. Ernie and Jason wanted the flexibility and spontaneity that only "live" music could give. As to the type of material the group would present, Ernie and Jason felt it should be a blend of the past and the present. They were influenced by such groups as the Statesmen and Blackwood Brothers of 1950s and 1960s, with their great harmonies, professionalism, and high energy, along with the showmanship and creativity of the Oak Ridge Boys during the late 1960s and early 1970s. In addition, Ernie had grown up listening to such ivory pounders as Jerry Lee Lewis, Little Richard, and Floyd Cramer, each coloring his style, and the sounds he wanted to incorporate within the music of the new group. Another priority was that the group would present original compositions penned by Ernie and Jason. The group, it was decided, would strive to present a broad spectrum of material ranging from traditional gospel classics to original works. Ernie and Jason felt the group should be different: Different in its approach to presenting the âgood newsâ through music; Different in its thinking, creating, and working outside of the established box; Different in its willingness to work with artists from other genres of music; Different in its ability to be âperformersâ presenting Christian entertainment; and most importantly, different by insuring that the âmessageâ of their music would always take first place. Throughout the years, Ernie Couch & Revival has certainly accomplished all these goals, and so much more! If you want a different musical and ministry experience, contact Ernie Couch & Revival TODAY using the information listed at the top of this screen!! !